In this post, I would like to share four speaking activities that worked very well in my classes. There are two games to practise comparatives and superlatives and two activities to practise describing people. The first two activities help your students practise the usage of comparatives and superlatives. The first one is a simple board game. Print the following board game. Ask your students to find something that will serve as their counter. Give them a dice and tell them to throw the dice and move along the plan. If they land on a yellow or blue square, students have to read the question and answer it or complete the sentence. If they land on a pink square, they follow the arrow. If a group of students finishes early, ask them to play again. The second speaking activity demands very little preparation. Dictate the following sentences to your students and ask them to finish them in any way they like. Who is the best _________? What is the worst ___________? What is better than _____________? What is worse than _______________? What is the best ________________? Once they complete their questions, they work in pairs and read their questions to their partners. Their partner must answer in English. It is really simple, but it works. Print the following worksheet. You will need one page for each student. Students work in pairs. Give each student one sheet so that in their pairs they have two different sheets. Students must not show their worksheet to their partner. Their task is to find out whether the men in their pictures are the same or different. Students describe the men number 1 and decide if they are the same or different. They write down their decision on a piece of paper. They go on like this with the rest of the men. 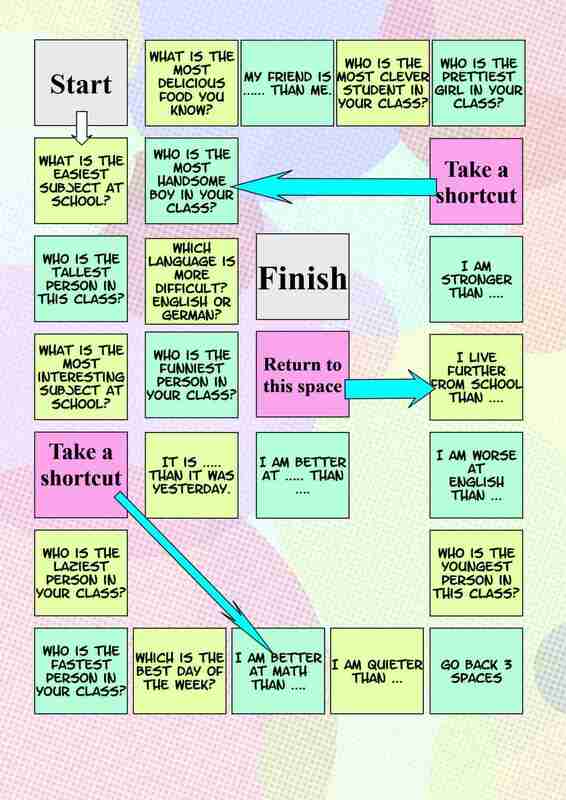 For the second speaking activity the students need just one of the pages. They lay the paper in front of them. One of the students chooses a picture and the other one has to guess which man their partner is thinking of. I hope that all the speaking activities will work for you. Which speaking activity worked best for you? Describing people - are they the same? Describing people - Who am I thinking of? Gracias por compartir. I LOVE your board game. It is so difficult to come up with spontaneous compartive/superlative activities that are fun. I wish I could change GERMAN and ENGLISH in the grid. But I love the color and prompts!! You can change the words to German. I would be happy if you could share the resulting game with me. Thanks.